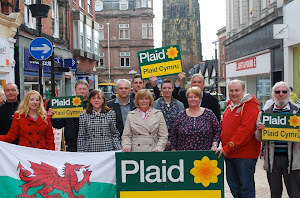 Plaid Wrecsam: Censored - Nadine Dorries. Now we know that these expenses were due to be published in July 2009 anyway, so why were the Telegraph so anxious to publish NOW was it just to maximise their scoop or was there an ulterior motive such as the influencing of the result of the European election...I think the lady's onto something. If this is right and at the moment it is an allegation, then there could be unintended consequences of the Telegraph's actions, it may not be the BNP and UKIP that will benefit from the public 'anti politics' disillusionment in Wales and Scotland but rather Plaid Cymru and the SNP. I'm sure Nadine Dorries doesn't need me to encourage her to repeat the contents of her censured blog in the House using the protection of parliamentary privelege, I'm sure the Guardian and Independent would publish her comments in full. Cyngor ar Bopeth Cymru ar Eisteddfod. In the name of God go!! Tories under attack by Tory bloggers!! Ian Lucas - Empathy with the Welsh Language? Brunstrom going...but with no job to go to!! Risky Strategy for Tory AM's.